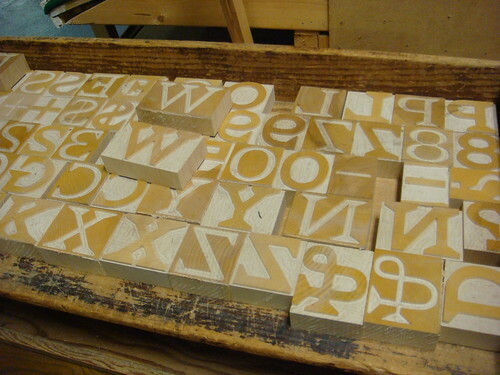 Matthew Carter will be introducing his first wood typeface, a chromatic latin-serif face called Carter Latin. The project has been in various states of development since at least 2003, but Hamilton has recently incorporated some digital technologies to solve issues of ink trapping and registration that had delayed previous tests done with less accurate pantograph routers. Richard Kegler (founder of the P22 type foundry) will be sharing “his thoughts on the state of type” (according to the official program). 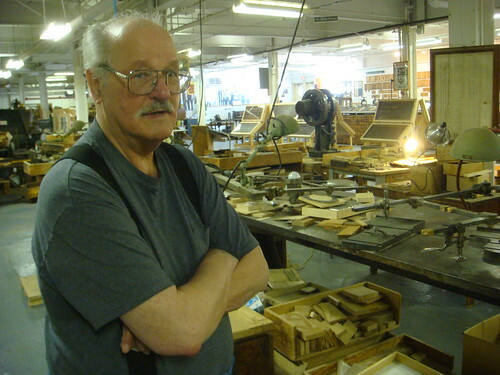 In conversations I had with Richard recently, he said he’d probably also be talking a lot about the Western New York Book Arts Collaborative that he started in Buffalo, New York. Designer Juliet Shen will also present a Lushootseed alphabet typeface she developed for the Tulalip Lushootseed Native American tribe in Washington state. Hamilton is cutting a new wood font of Juliet’s typeface to help give the “opportunity for this tribe to ‘manipulate’ their language by printing in their own font”. 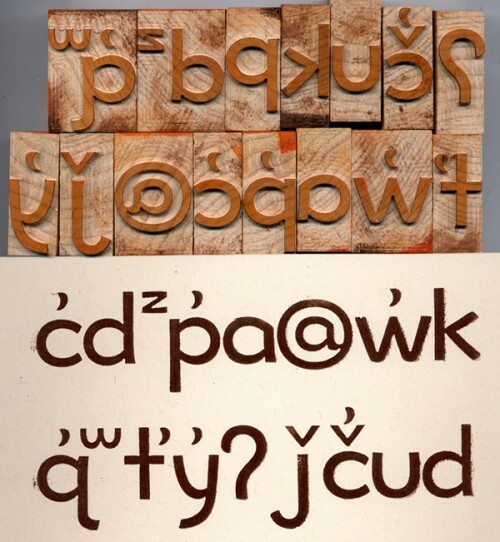 Last month, at the ATypI conference, Juliet presented some of the work she’s done on the typeface for the endangered language, but she didn’t go in to any details about the wood type project. I’ll be interested to see more info on that. Other than that, type designer Sumner Stone will join the presenters for a round-table discussion; a dinner party will take place at the Lighthouse Inn; the new Typeface documentary film about Hamilton will be screened; and several workshops and presentations using the museum’s amazing collection will be held by Richard Zauft (President of the Boston Society of Printers, Co-editor of Hamilton Wood Type: A History in Headlines , and Associate Vice President for Academic Affairs at Emerson College), Paul Brown (current Printer in Residence at Hamilton and Associate Dean of Art at Indiana University), and Jim Moran (Hamilton’s “Printer and Archivist” — though a more appropriate title would be something like “Director”, or “Guy-Who-Keeps-The-Place-Running”). 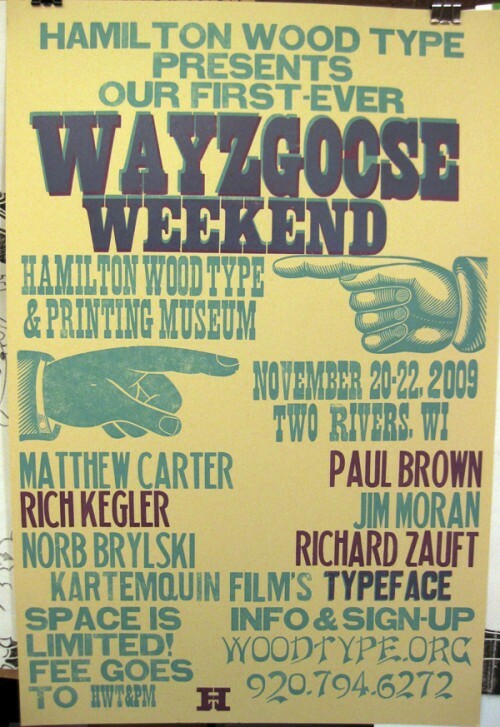 Finally, other than an open house, print swap, and general nerdery with fellow woodtypers like David Shields and Allen Stump (among other expected attendees), I am especially looking forward to some quality time with master type cutter, former type shop foreman, and unofficial Hamilton mascot, Norb Brylski. See the official program for a full schedule of the weekend’s events (also available as a PDF).